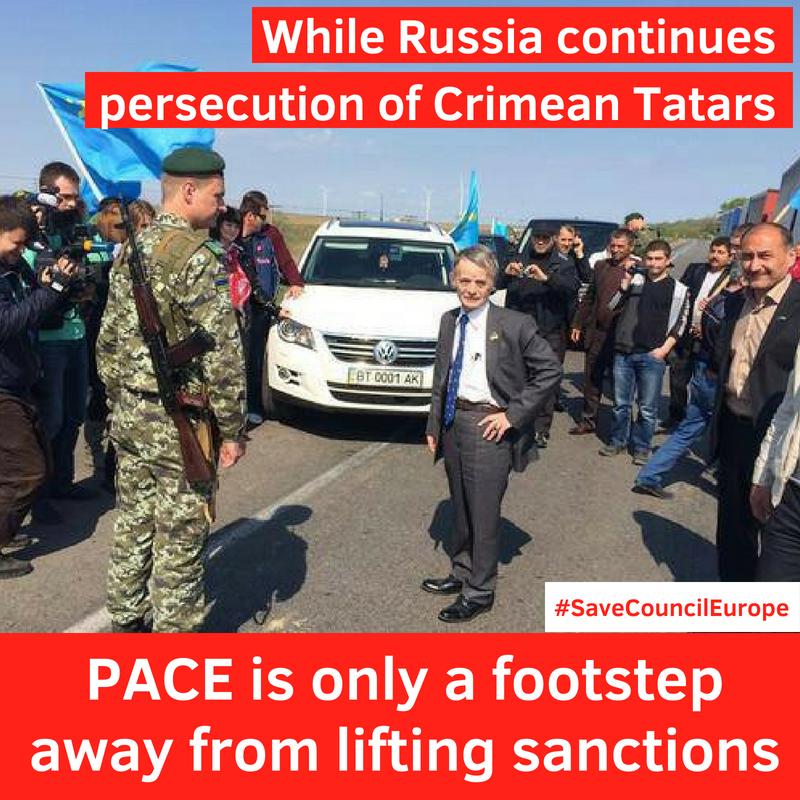 Join an online campaign to stop Putin’s sly plan to lift sanctions against Russia in the Council of Europe that were imposed because of Putin’s military aggression against Ukraine and illegal occupation of Crimea. This Wednesday April 10, the Parliamentary Assembly of the Council of Europe will vote for the resolution aimed at lifting sanctions against Russia. There is not a single word in the document on that, but everybody understands that amendments proposed to the Rules of Procedure of the PACE would make sanctions prolongation impossible. Thorbjorn Jagland, Council of Europe secretary-general, plans to succumb to Russia’s demands to restore its voting rights in the Parliamentary Assembly of the Council of Europe (PACE). Fearing Russia’s departure from the Council of Europe, many PACE members, led by the German delegation, seem willing not only to renew the Russian delegation’s voting rights but to deprive PACE of the right to impose sanctions against any member state that does not comply with its principles as well. This will utterly compromise the Council of Europe and turn it into yet another toothless and meaningless international body unable to react in response to gross human rights violations. There are PACE members, who share Thorbjorn Jagland’s fear that if Russia left the organisation, the ordinary Russians would no longer be able to appeal to the European Court of Human Rights that hears applications coming from all 47 Council of Europe member states. Indeed, this would be the case but it must be taken into account that Russia is renowned for not executing judgments of the ECtHR and, according to the law enacted in 2015, the Russian Constitutional Court may decided whether to respect judgments of ECtHR or not! In fact, the ECtHR jurisdiction over Russia has much more symbolic than real effect. 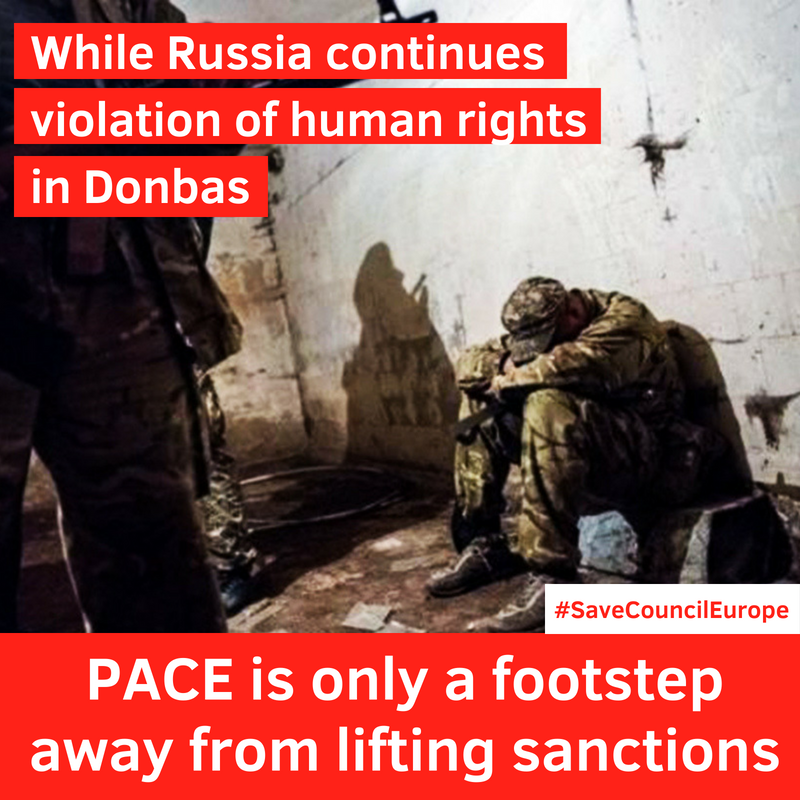 But it is also about money – in response to the sanctions, Russia has stopped paying its membership fees to the Council of Europe – €33 million annually, a 7% of its budget. However, as painful as it may seem, it is not a trade deal – it is about fundamental values. Last but not least, none of the Council of Europe’s demands to Putin regarding Ukraine’s territorial integrity and stopping violations in occupied Crimea and Donbas was ever implemented. Around 97 Ukrainian political prisoners are held in Russian prisons – Oleh Sentsov, dying Crimea Tatar Edem Bekirov and 20-years old student Pavlo Hryb, are only some of them. More than 120 captives are kept in basements in certain areas of Donetsk and Luhansk regions.The persecution of the Crimean Tatars escalates. We have to stop this technology – the sanctions against Russia must not be lifted as it will only provoke the Kremlin to further aggression and complete disregard of international laws. And all other autocrats will feel encouraged to follow him. Impunity is not the solution – it is the very nature of the problem! We call you on to join the online-campaign #SaveCouncilEurope on April 9 and 10. Log in your Twitter account. Tweet campaign’s call to action (please see it below). Add one of the pictures (also see the link below). Tag politician’s username with the “@“ symbol. The more posts you do, the more chances for success!